At the On Big Shoulders album release concert on Sunday, December 2, 2018, the band was joined by blues legend & Chess records artist Barbara Carr, who came up from St. Louis to celebrate with us (we covered her hit “Shake Your Head” on our album). It was our first time meeting Barbara, who was so kind to us and so enthusiastic about sharing the stage with us. Here’s to many more songs together! Today marks the release on Allograph Records of On Big Shoulders, a Chicago-themed album I concocted in March 2016, recorded in July 2017, and am now proud to see enter the world on CD, vinyl, and via various streaming platforms. Co-produced with GRAMMY-nominee Liam Davis, On Big Shoulders features 12 Chicago musicians playing 10 songs linked in one way or another to Chicago. We’re having an album release concert for the record on Sunday, December 2 at the Old Town School of Folk Music. This might be the only time that most of the musicians on the album will all be in the same place, and it will definitely be the first public performance of any of the material. Matt Brown on the podcast "Get Up in the Cool"
Check out the latest episode of Get Up in the Cool, on which I was the guest. It was a bunch of fun to play fiddle & banjo duets with host Cameron DeWitt, and talk about decoding old-time music and the Old Town School of Folk Music. Cameron also was one of the first people for whom I played On Big Shoulders, an Americana album I concocted featuring Chicago music played by Chicago musicians. The Kickstarter campaign to fund the manufacturing of On Big Shoulders runs through March 31, 2018 and can be found here. I'm excited to write that today, Big Sadie's debut album has been released. Entitled 'Keep Me Waiting,' it comprises original songs (and one instrumental) penned by bandleaders Elise Bergman & Collin Moore. It's such a joy to play in this band. Check it out! Getting to interview Stephen Wade for StoryCorps & the Old Town School of Folk Music at the Chicago Cultural Center last month is already one of the highlights of my year. If you haven't yet read Stephen's remarkable book, read it now. I had a wonderful experience opening for Julian Lage & Chris Eldridge at the Old Town School of Folk Music this past Sunday. I've been a fan of their music for years, and I delighted in getting to visit with them before the show, jam on "Forked Deer" in the lobby with Critter, and then soak in all their incredible music during their set. I was joined on my portion of the program by my Big Sadie bandmate Elise Bergman, who sang beautifully. One of the songs we performed was the ballad included below, which Elise learned from the singing of Daron Douglas. Click here for Phil Solomonson's enthusiastic review of the concert. My 2010 album, "My Native Home," is now available as a digital download and to stream! It features guest appearances by Tim O'Brien, Brittany Haas, Mark Schatz, and Ben Krakauer, as well as rare songs from my home state of Pennsylvania. I had the great honor last night of once again sitting in with Mike Snider's band at the Grand Ole Opry. Mike is renowned for inviting visiting musicians, particularly fiddlers, to join him onstage for this incredible experience. As a music-loving resident of The Windy City, I notice that it is nearly a part-time job keeping up with all of the terrific artists that play in and around Chicago. And my students and friends are often unaware of some of the shows I've found my way to, so I've created a Facebook group solely devoted to rectifying this. If you'd like to see a semi-regular feed of my top picks for old-time, bluegrass, and Americana concerts to attend in Chicagoland, click through here and request to join the group. I'm thrilled to join the board of governors of The Recording Academy's Chicago Chapter. They are posting "Meet the Board" segments and mine reveals the night I first heard live music. Find it here. Greg Reish and I were delighted to find the following review of Speed of the Plow in April's issue of Bluegrass Unlimited. Exciting news in the old-time fiddle world: Kentucky fiddler William Hamilton Stepp's legendary rendition of "Bonaparte's Retreat" was added to the Library of Congress National Recording Registry yesterday! The press release is here. Stepp's life is chronicled in remarkable detail by Stephen Wade in his seminal book, The Beautiful Music All Around Us. The book's publisher, University of Illinois Press, had this to say about Stepp''s inclusion in the Registry. Ahead of our album release show at Swallow Hill Music in Denver on Friday, Barry Osborne conducted an interview with me and Greg via email. You can read it here. I had a fun visit to "Nocturnal Journal with Dave Hoekstra" last night in downtown Chicago. It was Halloween (I dressed up as a professional folk musician), and I had the good fortune of attending the first set of The Dave Rawlings Machine concert at The Vic before heading down to the Loop to Tribune Tower, where WGN Radio is housed. Click here to listen to all 17 minutes, commercial-free, of my chat with Dave. You'll hear me play fiddle & banjo, and talk about my life so far as an old-time musician, my new album with Greg Reish, and our upcoming album release concert at the Old Town School of Folk Music. The coolest thing happened tonight ~ Matt Combs got me and Greg Reish backstage passes to the Grand Ole Opry, a treat in and of itself. Upon arriving, Matt introduced me to clawhammer banjoist Mike Snider, who was performing on the show with Matt and Brian Christianson on fiddles. Mike asked if I had my fiddle with me. After I got it and we tried a triple fiddle medley in the green room, he invited me to join them onstage. Greg filmed this clip of me playing once through Mississippi Sawyer. So much fun!!! 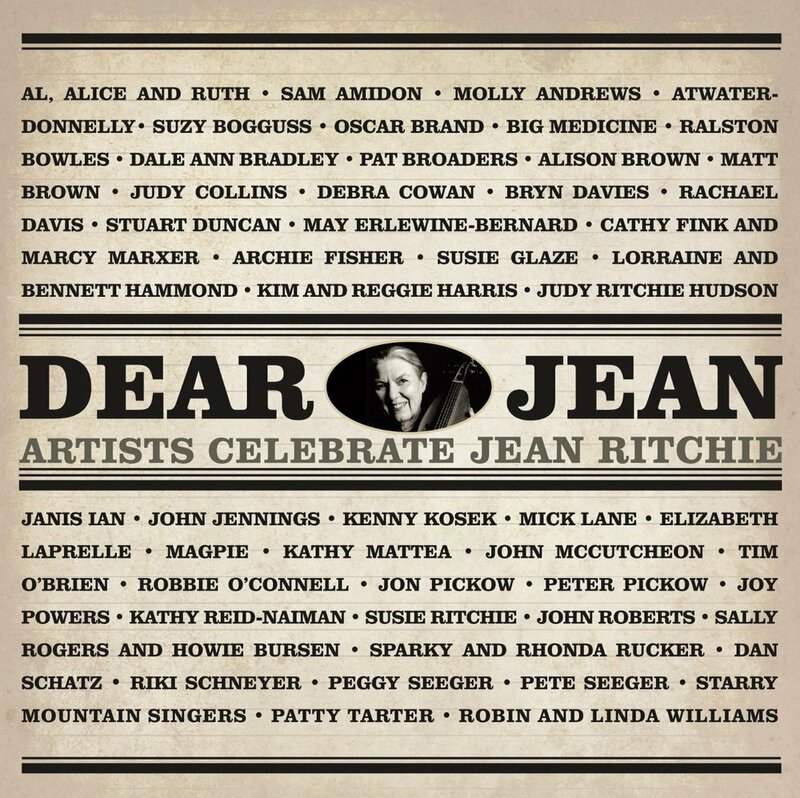 On September 2, 2014, Compass Records will release Dear Jean: Artists Celebrate Jean Ritchie. Writing for The Lonesome Road Review, Donald Teplyske called it a "uniformly outstanding tribute." The album, produced by Mick Lane, Charlie Pilzer, and Dan Schatz, features many of my favorite folk artists, and I am humbled to have been included on it as well. I play fiddle on two of the tracks: Dan Schatz's gorgeous rendition of Jean's original "Thousand Mile Blues" and my own solo fiddle arrangement of the traditional play-party song "Golden Ring Around the Susan Girl." I had a wonderful time recording with two great engineers here in Chicago. Jesse McQuarters at WFMT helped me with Dan's track and Dennis Cahill, a long-time musical hero and recent duet partner, recorded "Golden Ring" in his own studio. This album gives us a wonderful opportunity to celebrate Jean Ritchie's life, legacy, and music while she is here to bask in our appreciation, and also to turn our attention to the causes for which she has advocated throughout her life. Susie Glaze, whose rendition of Jean's "West Virginia Mine Disaster" is an album highlight, wrote a lovely article about the pre-release celebration concert in Berea, Kentucky that featured Jean herself singing from the front row. John McCutcheon, Tim O'Brien, Suzy Bogguss, Kathy Mattea, Stuart Duncan, and Bryn Davies open the album with a stunning rendition of my favorite Jean Ritchie composition, "Black Waters." The song is devastatingly relevant, a necessary reminder of the havoc we continue to wreak on our planet. Support the campaign by visiting www.AppalachianVoices.org.